The Triangle has become a destination point for high-end burger chains. Five Guys has long had a presence. Zinburger opened at SouthPoint late last year. 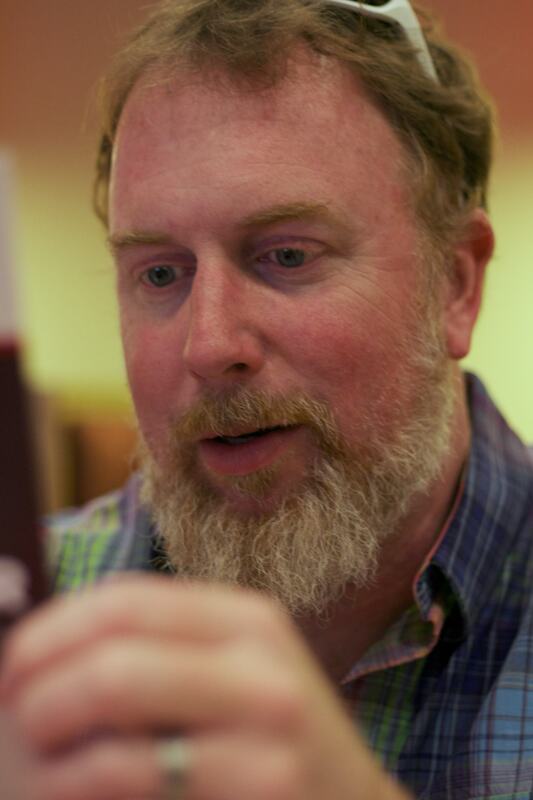 Before that, Elevation Burger brought its sustainable, organic, grass-fed ethos to Brier Creek. 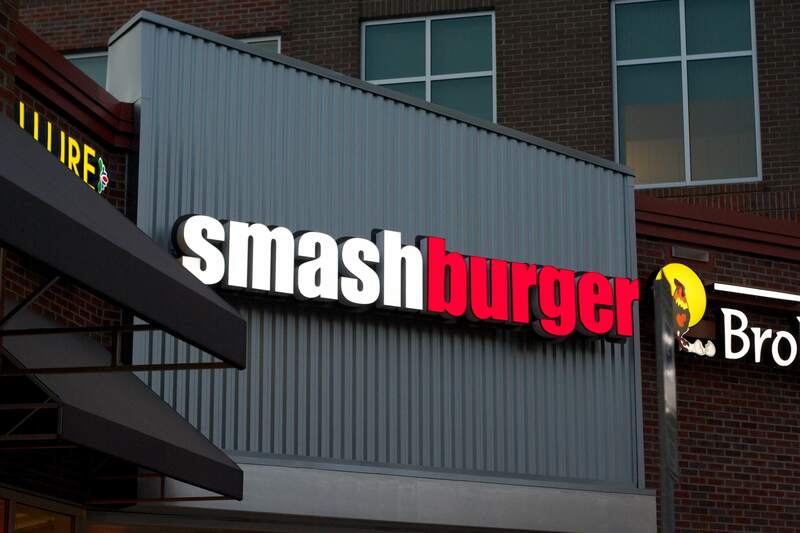 The latest entry in the fast-casual boutique burger war is Smashburger, opening March 12th, 2014 across from Duke Hospital in Durham. Recognizing the power of The Straight Beef, Smashburger PR issued an invitation for a preview tasting. 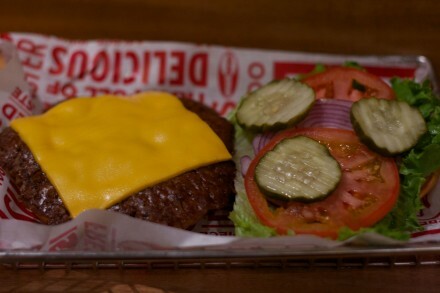 Smashburger did a wonderful job of giving us a glimpse into how they prepare their tasty burgers. They did more than that, though. Greg Creighton, the chief operating officer, gave us a tremendous amount of information about the philosophy behind why they do what they do. 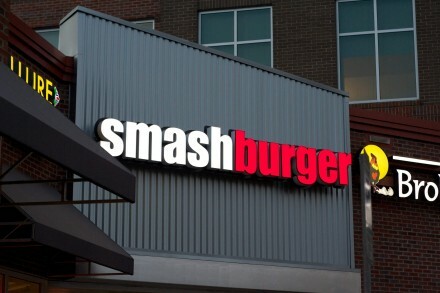 The location in Durham which opened on March 12th is number 259 for Smashburger. The founder, Tom Ryan, is responsible for the Stuffed Crust Pizza, McGriddle, and McDonald’s Dollar Menu, amongst other fast food innovations. We spoke with the owners, and they plan on opening six to eight more locations in the Triangle. Greg threw out some interesting facts. Smashburger only uses 100% certified Angus beef in their burgers. The cows are “grain fed, grass finished” in the Midwest and the beef is shipped fresh. 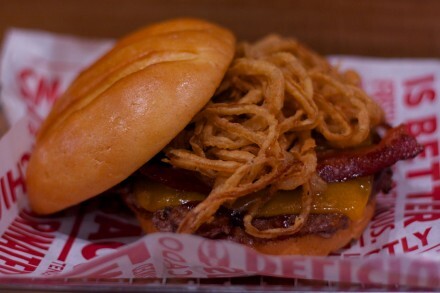 Only 8% of the beef used in burgers is certified Angus in the US and Smashburger uses 40% of that. All the buns are baked at a facility in Chicago. We were able to try four different types of bun: egg, multigrain, pretzel, and chipotle. Huzzah! Not a kaiser roll in the bunch. While Smashburger does have salads, a black bean burger, and chicken sandwiches we won’t touch on those here because this site isn’t The Straight Salad. This black bean burger is missing something. A beef patty I think. If you are into thick burgers, Smashburger is not the place for you. They use a proprietary “smasher” to prepare the patties. The beef is seasoned and cooked on a buttered flat grill. 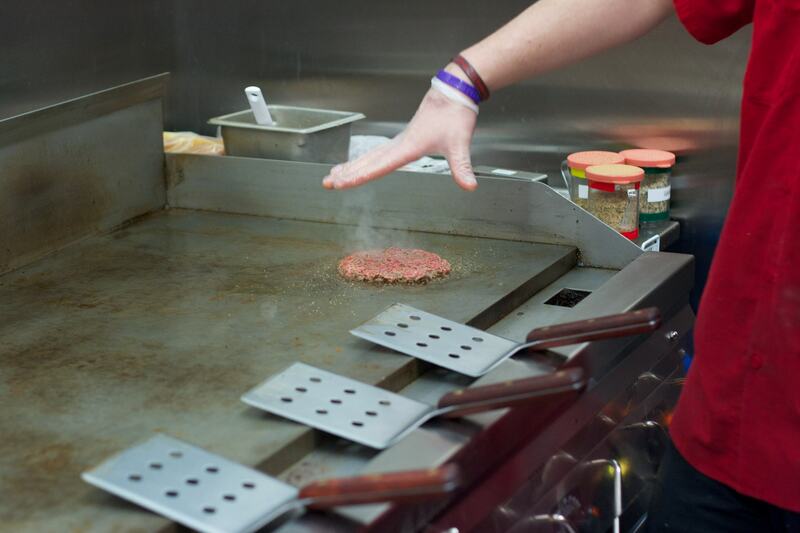 The burger is cooked to order, and a properly trained cook can prepare one in 2-3 minutes. The chicken sandwiches are prepared “picatta style.” Everything is flat to help with speed. 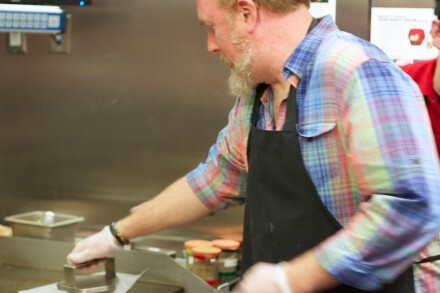 Their goal is to have a freshly cooked meal ready for you in 6 minutes. They have burger prep down to a science. Obviously, this is done to make sure the Smashburger experience is consistent not only from location to location but from visit to visit. The length of the smash, the pattern of the sprinkling of the seasoning, the angle of the spatula, the places the temperature is checked – everything has a specific reason for why it is done. The trainer told us that the seasoning side is placed down so that the tongue touches it first. They really have thought of everything. This technique will only work on a flat grill as smashing a patty on an open grill will only get you a flat dry burger. The smasher doesn’t have any holes, so no juices can escape through the top either. If you’re going to try this at home, I would suggest using a small cast-iron skillet or a heavy tea kettle to achieve the same effect. If you want to learn more about this technique, please read the excellent Burger Lab article by J. Kenji López-Alt. Enough with statistics and technique, let’s get down to talking about the burgers. We were able to sample four different burgers. The first was the Classic Smash which had American cheese, Smash Sauce, ketchup, lettuce, tomato, pickles, and red onion on an egg bun. I could tell you what’s in the smash sauce, but I would have to kill you. I will say, however, that there is no Thousand Island dressing. The Classic Smash was the best of the bunch as it allowed the flavor of the patty to shine. You can’t go wrong with this choice on your first visit. Next was the BBQ, Bacon & Cheddar Burger, which was topped with cranberry BBQ sauce, applewood-smoked bacon, cheddar cheese, and haystack onions. This combination of flavors would have worked great on a thick burger. Unfortunately, it overwhelmed the thin patty. Maybe order this selection on the chicken sandwich, but the burger disappeared here. Hello, is there a patty in there? The Truffle Mushroom Swiss Burger made up for the previous one. The sautéed crimini mushrooms and truffle mayo accentuated the already flavorful patty. This one’s a really nice change-of-pace burger if you want something a little different for lunch. The Regional Burger was a Carolina staple, a chilli burger topped with slaw on a pretzel bun. The pretzel bun was necessary to hold the somewhat soupy toppings. It was nice to see they didn’t resort to using a kaiser roll. This one’s solid but nothing that you haven’t had before. When you go to Smashburger, get the Classic Smash with one of their top-notch sides. When you go back, experiment and make your own. Unless you go overboard with the toppings, you will not be disappointed.